The work is in three sections with the print as the central section. I used a glass printing plate, the width of the finished piece, covered with Thermofax printing ink and drew my design into this on white cotton. I then painted the sky and earth sections of the print with a mixture of fabric paints and inks. There are a few ‘stripes’ of printing ink among the trees, but these do not worry me. The top and bottom thirds of the work are cut from the same piece of variegated commercial fabric. I added a layer of grey/blue chiffon to the top and rust/brown chiffon to the bottom, to give each a richer colour. 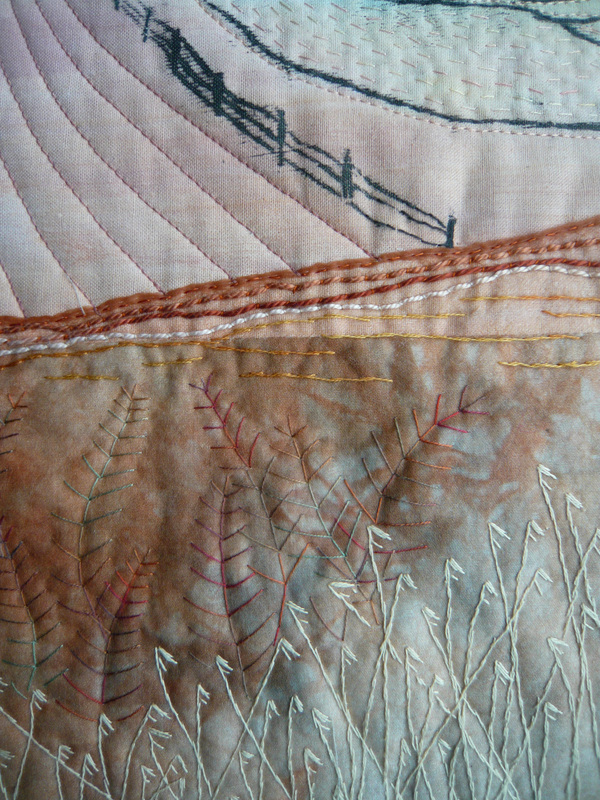 I added a line of black quilting stitches to the printed ‘contours’ of the fields, then machine quilting for the ploughed field, and the ‘clouds’ in the top section. The grasses and ferns of the foreground, and the remainder of the other elements were worked by hand. I enjoyed this process and even though the print does not cover the entire surface, I am happy with the way it works into the overall piece. One bonus for me in this piece is that my husband has declared that he likes it (he who normally says – “it’s OK”, or “what’s it supposed to be”!). I like this very much…and am interested to note that you did not quilt the trees themselves, but the background behind them. This is very striking and I like the way that you have added top and bottom without losing the print in the middle. A very nice piece, you succeeded very well in letting the winter speak, in colour and in the landscape. Beautiful details in your handstitching. Glad that your husband liked it….. Wonderful piece. Beautiful combination with hand and machine quilting. The chiffon layers really enhance the piece. 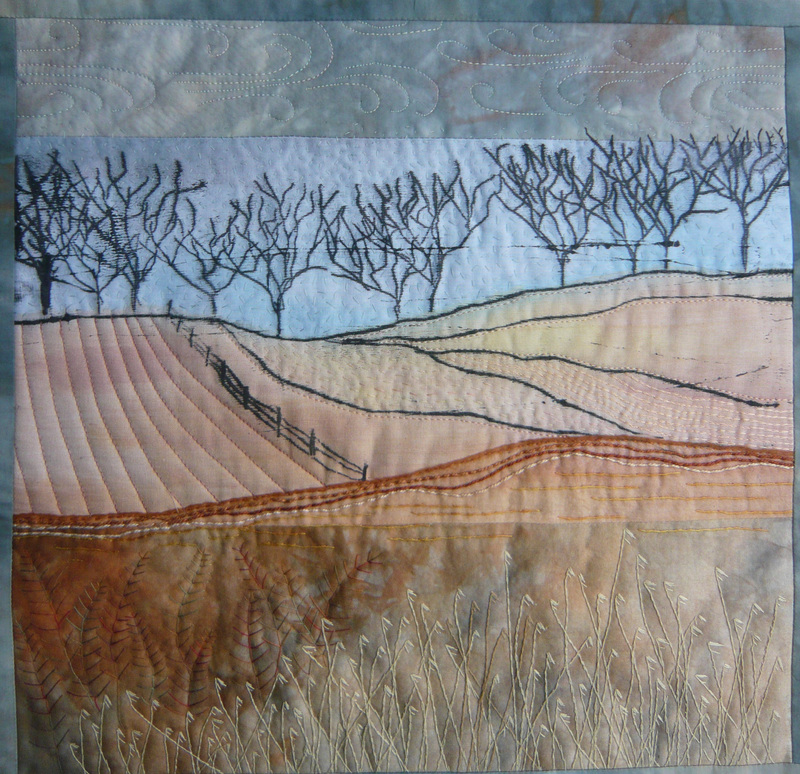 Very nice piece, I like the perspective in your quilt. The combination of hand and machine quilting works well. 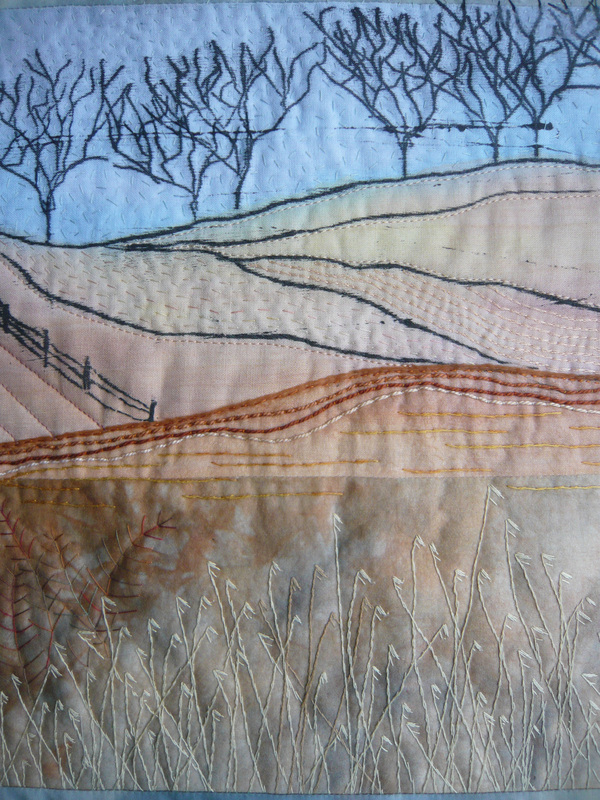 The piece evokes the small English fields that I remember from childhood. The wintery scene feels like the English countryside. Northern England in miniature! It’s beautiful. Beautiful how you used the variegated fabric for the top and bottom part. Tha handquilting is very effective. Your husband is right! I truly love this quilt and your interpretation of nature.